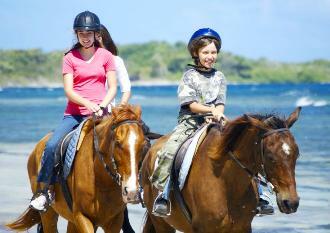 A very special opportunity to enjoy the exhilaration of riding into the ocean and learning about Jamaica's history. 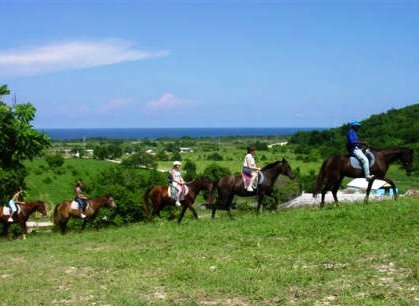 Trail Masters will pair you with a horse to match your riding ability, and then you are off on a guided tour through the scenic countryside, along the shoreline to a white sand beach. Prepare yourself for a totally unique experience, as you and your new friend stroll along the shoreline of a private beach. 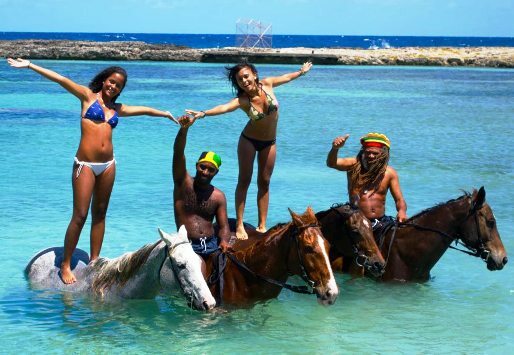 Strip down to your bathing suit and get ready for an invigorating swim on horseback, as you enter the warm waters of the Caribbean. 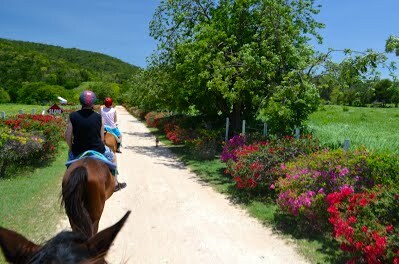 Your Falmouth beach horseback ride n swim excursion continues to the gardens brimming with pimento trees, bougainvillea and fishtail palms. Lollygag with a cool drink in hand while you enjoy the sights of the hummingbirds gossiping with the orchids before your driver takes you to the next destination or back to your ship/resort. * If combo rates are not posted, please Contact us! The experience was great! Our driver, was an amazing person, and seem to really care that we had a great time. He did everything he could to make sure we were comfortable, even found us a local spot to eat. My wife and I have already talked about it, and we will definitely book through you guys again when we come back. We had a very nice experience and thoroughly enjoyed ourselves, our guides, and especially our driver, Vincent Clarke. He was exceptional! Our driver as very helpful. Horseback ride was good. We had an incredibly good time, the driver was wonderful , professional and an exceptional driver. The four men that helped us were also wonderful. My husband and I hadn't been on a horse in 40 years and the young men gave us great instructions the whole way. They were professional and very, very kind. We loved every bit of it . Thank you for all that you do. Good experience. The falls was great. We had the perfect guide for our experience in Jamaica. Our driver meet us at the cruise taxi area in Falmouth and took us to our first destination. It was horseback riding. We had booked horseback riding and duns river falls excursion that day. 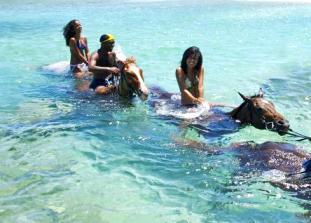 We preceded on our horseback ride and swim with the horses having a great time. When we got back to the stables our driver took us to Dunn\'s river falls and got us with a guide for us to experience this wonderful attraction. After we finished the falls he brought us back to our ship dock. He was the perfect gentleman to my wife and I allowing us to enjoy Jamaica to it\'s fullest. The trip went very well! Yes! Our driver, Peter, was wonderful and made us feel very comfortable and welcomed. The horseback ride was perfect and something we will always remember. When we got back, Peter was there waiting for us. Overall, it was amazing from start to finish and we would definitely book with Jaital again! Thank you for a wonderful experience! The trip was safe, the driver Paul alias \"Pablo\" was easy to find and we didn´t need to wait for him too long. He brought us safe back to Falmouth to Royal Caribbean pier. One of the most interesting stops was a stop at a local supermarket. At the Dunn´s river falls, despite of the crowd, our guide made our way very well through the falls. Also the horseback ride was good: there were enough people to help us: four of us had never been riding a horse before! However, the ride was shorter than we expected, and we didn´t spend much time in the sea. But definitely we would like to learn more and ride again one day!